Video: Jefferson diverts the other presidents as Washington waltzes to victory | Let Teddy Win! 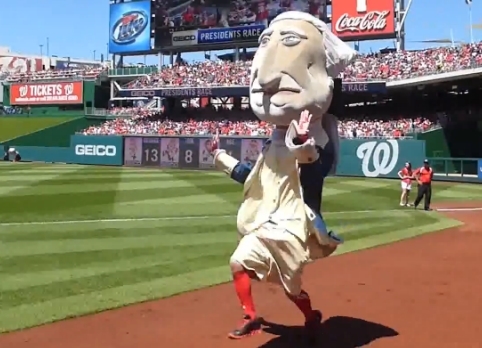 After dominating the first month of the season, Nats racing presidents George Washington and Thomas Jefferson have watched rivals Abe, Bill, and Teddy pick up some recent late-May momentum. But on a beautiful Sunday afternoon at Nationals Park, they decided they’d had enough. Jefferson set up a diversion at the starting gate, sending Abe, Bill, and Teddy towards the wrong side of the field. George Washington, waiting in the bullpen, jumped out and well ahead of Jefferson to waltz his way to a shady presidents race victory, his fourteenth of the young season.